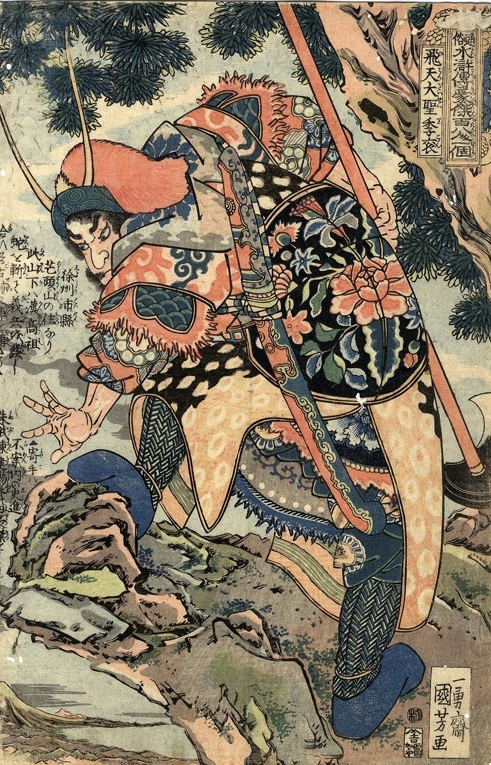 Kuniyoshi. “108 Heroes from Water Margin, Hitendaiseikikon.” A nice illustration of the interplay between Japanese and Chinese martial culture. Are the Asian Martial Arts Inevitable? I suspect that students of Chinese martial studies are overlooking one of the most perplexing, interesting and possibly illuminating questions that our field can ask. We spend so much time recording, studying and theorizing about the history of Taiji, or the connections of the martial styles of Fujian and Guangdong province, that we never really stop and ask why there are martial arts in China at all. We treat the presence of the martial arts as inevitable, almost axiomatic for any “traditional” Asian society. After all, we see martial arts in China, Japan and Korea. Why shouldn’t we just assume that these forms of social organization are widespread? Even a few minutes of meditation on this grouping of East Asian societies should suggest the weakness of that assumption. To begin with, while it is true that both Japan and China have robust martial traditions, it is not at all clear to me that they have them for the same reasons or that they play the same role in both societies. Japan spent centuries as a feudal state, and it was within this environment that its martial arts were birthed (though I hasten to point out that they came of age in the modern world of the late 19th and early 20th century). The martial arts were tied quite strongly to the Japanese social system and the unique questions of identity which it posed. The very top elements of the feudal structure were able to carve out a privileged position for themselves in these martial traditions and hence it was in their best interest to promote them. Once the real samurai were replaced with the myth of the “samurai spirit” in the late 19th and early 20th century, both the Japanese government and social leaders concluded that a modified form of the traditional fighting arts were still an essential part of the new nations “modern” identity. At the same point in time fundamentally different factors were at work in China. China was not a feudal state. It was a bastion of bureaucratic-authoritarian power. These political realities led to fundamentally different sorts of social organization. Specifically, in China direct military power was not what kept most elites in power. Instead the Emperor and his protective belt of Confucian administrators were sustained by a complex mesh of cultural and social variables all supported by specific economic privileges. For them military force was one tool of statecraft among many. Further, it was a dangerous tool that had to be carefully managed and restrained because of how easily it could be turned on its erstwhile masters. For most martial artists during the Ming and Qing dynasty, military skills were a means to a paycheck and a coveted place on the official ladder of government power. Still, it was a low rung and a limited calling. It is not really all that surprising then that the martial arts have been worshiped in Japan and despised in China. Both attitudes are a reflection of much larger social structures, or at least deeply held aspirations of what the institutions of social organization should be. Actual power structures have a bad habit of skirting these sorts of norms. So yes, we see “martial arts” in both places, but I do not think that we are actually seeing the same, or even a very similar, social phenomenon. Korea complicates the picture even further. There is not much evidence supporting the existence of any sort of traditional Korean “martial arts” at all in the 19th or early 20th century. Early on the Korean nation was dominated by Chinese martial traditions and texts. Later the Japanese imposed their own martial arts structures on the Koreans. This is often taken to mean that the Chinese and the Japanese repressed or destroyed the traditional Korean martial arts, which have since been re-expressed in Tae Kwon Do or Hapkido. Yet the truth is Tae Kwon Do is a derivative form of Japanese Karate with a totally fabricated history. It has practically no connection to ancient Korean martial tradition. Not only that, there is not much evidence that any totally unique art like Tae Kwon Do or Karate actually existed in Korea during the 19th century for the Chinese to pollute or the Japanese to suppress. It is important not to overstate the case. Korea was full of incredibly tough and ingenious warriors. The state has had a proud military tradition. Yet that is not quite the same thing as having a “martial arts” tradition. The latter is by definition a civilian undertaking and part of civil society, usually supported by economic markets. In fact, why would we even expect to find these things in traditional Korea? I think the unstated answer is because they existed in Japan and China. We expect to see them in Korea because we all “know” that martial arts are important markers of identity in Asia. Today they are viewed as being like flags or national anthems. It is just assumed that everyone must have at least one. Even in the academic world I suspect that this belief is more widely held than most of us would like to admit. To be totally honest it is not even clear to what extent Japan can claim a unique unarmed combat tradition. Karate has its origins in Okinawa, and ultimately the triangular trade that originated along the coast of southern China. It is basically a highly modified expression of Fujianese “external” Shaolin boxing. Jujitsu also traces its origins to China at the end of the Ming dynasty. Granted, a lot of history and modification have happened since then. Yet it turns out that this was not the sort of practice that the Samurai were going to invent on their own. Most of the spear and pole fighting techniques that were so critical to late Japanese feudalism were also imported directly from China, where they were developed in response to rapidly evolving battlefield conditions. Obviously some martial traditions are indigenous to Japan. A few of the higher profile examples would be Sumo wrestling, Kuydo (archery) and the various styles of Japanese swordsmanship. Still, these aren’t really the things that most people envision when you mention the “martial arts,” even in Japan. If Japan had been totally cut off from China prior to the 20th century it is clear that their martial arts would look very different than they do today. It is probably not a coincidence that many of the states that have great martial arts traditions today, like Japan and Korea, have also had a lot of contact with Chinese individuals and communities. The Chinese diaspora has deeply affected Vietnam, Singapore, Malaysia and Indonesia, to name just a handful of places. Further, the martial arts in all of these places show evidence of their contact with Chinese communities. This evidence usually does not show up in the specific weapons or boxing techniques. These can and do vary tremendously from place to place. Rather it usually has something to do with the basic forms of social organization and myths that are adopted. In truth there is nothing obvious or automatic about the codification of local fighting traditions into civilian, publicly taught, “martial arts” which are also seen as mechanisms for transmitting local culture and identity. 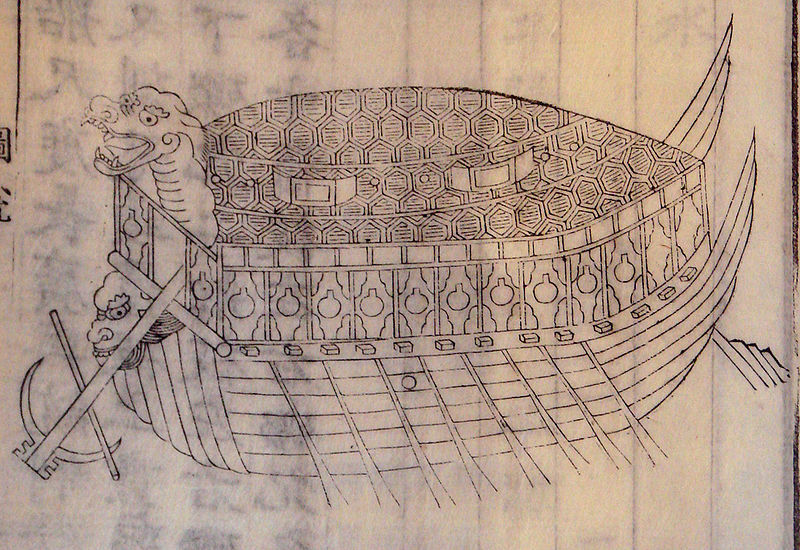 16th century Korean turtle ship in a depiction dating to 1795. This innovative and original weapon proved to be both effective and well ahead of its time. Having a proud warrior tradition is not enough to ensure the development of indigenous “martial arts.” It is well worth remembering that most societies never developed their own civilian martial arts traditions. There are a few basic factors need to be in place first. To begin with, the economy needs to be large and diversified enough that some individuals can become specialists in violence. Further, there needs to be enough economic surplus that a wide range of students, not just those in the military, can undertake military training. Of course to attract students there must also be an economic outlet for this activity, either in the hiring of civilian “experts” as military instructors or guards in some other area of the economy. Lastly, a monetized financial system and widely based tradition of literacy is quite helpful in regularizing and spreading these practices. Lacking a supportive market and an independent civil society (i.e., one not dominated by either the military or the government) it is not logically possible for “martial arts” as we understand the term today, to evolve and thrive. Most places in the pre-modern world lacked one or more of these ingredients and so no martial arts developed there. In other places most of these factors were in place, so when the idea of the “martial arts” was introduced by outside forces it could be adopted and integrated into local society. Of course what I have just done is to introduce a theory explaining why we see the martial arts in some places, but not others. Further, this is a very general theory. It should apply to the martial arts in India and Europe just as easily as it explains Malaysia or Japan. The next step is to think seriously about how accurate this theory is. After all, it was the product of a blog post. It seems reasonable enough, but there is a lot that can go wrong with any sort of theory, especially ones that you read on the internet! Obviously I need to gather data to test my theory. At this point most undergraduate students, and even a few graduate students who should know better, will begin to write an exhaustive research paper on the historical evolution of the martial arts in Japan, China and Korea. At the end of 30 pages of painstaking review they will first discover that their theory was correct! Then they will be shocked to see the B- on the top of their paper. This grade will usually be followed by a note about how they should think more carefully about logical fallacies, and exactly how important a 20 page page-limit is to a cranky professor with another 30 research projects to grade. So did you catch the problem? I advanced my theory of the development of the martial arts by thinking about China, Japan and Korea, and then I tested that theory using the exact same set of observations from China, Japan and Korea. This is totally circular reasoning, with a fair amount of confirmation bias thrown in for good measure. There was not a possibility of discovering that my theory was wrong, or incomplete. Chances are I didn’t even learn anything all that new writing and researching the paper as I was pretty sure how it was going to end before I even started it. Post-diction, or explaining and predicting past events, is central to the comparative method in the social sciences, but it is also an exercise that is full of potential pitfalls. How do we avoid these sorts of logical traps? In a situation like this it is often best to begin by asking what Sherlock Holmes might do. Critics and readers are in broad agreement that “The Adventure of Silver Blaze” is one of Arthur Conan Doyle’s best stories. However, from the perspective of a social scientist there is one passage that is particularly memorable, and it has nothing to do with the missing race horse. Rather it focuses on a household dog. As so often happens in these stories Holmes is called out to the scene of a crime. There is a prickly detective who shows Holmes around and they go over the evidence. At the end of the exchange the detective asks Holmes if there is anything else that he would like to draw his attention to. To which Holmes replies that yes, he would like to mention the curious behavior of the “dog in the nighttime.” To which the police inspector notes that the dog did nothing in the nighttime. This, of course, was exactly the point that Holmes was trying to make. Given all of the mayhem, murder and thievery in this story one would expect any dog to be yammering its head off. That is just what dogs do, it is in their nature. But this dog didn’t even bark. Why? Sometimes dogs that don’t bark are the most important witnesses of all. Likewise in the social sciences non-events can be really important. They are a great way of multiplying your observations, and that in turn is essential to the proper uses of the hypothetico-deductive method. A selection of six kukri’s issued to the Royal Nepalese military in the early 20th century. So let’s say we have a theory about the origin of the martial arts like the one above. If we want to test it we need to be able to do two things. First off, we should think of a case (or a set of empirical observations) that we did not use in the creation of our initial theory. Enter Nepal. Nepal has one of the proudest warrior traditions of any state in Asia. The kukri is a common symbol in military, political and even social life. All Nepalese soldiers are issued a kukri upon enlistment in any of the various armies or police forces that they serve with. Traditionally this wasn’t much of a problem as most Gurkha soldiers grew up on farms and used these unique knives every day for a variety of tasks ranging from splitting wood to butchering animals. Recently Nepal has undergone some urbanization and consolidation in the agricultural sector. It is no longer the case that all raw recruits in the military grew up on farms and know instinctively how to use their kukris. Suddenly these various police and military forces have found that combat kukri training is actually necessary. This should be no problem. You just need to find a traditional Nepalese martial arts master and have them show you how it is done. Except that you cannot. Nepal is full of fighting experts, but for the most part they all study Karate, Judo, Tae Kwon Do or Indian wrestling. Almost all martial artists in Nepal study exactly the same set of hand combat systems that are popular in the west today. Given how important the Kukri has been to recent Nepalese military and social history, this is just astounding. But should we be surprised? After all, we now have a theory that tells us that martial arts are not going to be found everywhere. They are only likely to thrive in a place where there is both a free civil society and robust market forces that can support a body of trained civilian fighting specialists. We are most likely to see this in a larger society with things like a monetized economy and a widespread tradition of literacy, though exceptions do occur. Immediately a couple of problems appear for Nepal. It is not a large state and the economy has not been hugely prosperous. Yet the more basic problem might be the lack of civilians interested in paying for combat instruction in the first place. In the recent past whether one could even join the military was in large measure a matter of caste and ethnicity. Some groups were eligible, others were not. If you were accepted for military service the terms of enlistment were often quite long. Further, those groups that were excluded from service were often the least financially able to maintain their own fight masters and schools. I suspect that each one of these groups had some combat traditions in the past, whether it was wrestling, archery or knife fighting. Yet with no government backing and no incentive to teach this materially publically to students outside of the immediate community, these traditions have largely withered and faded. It would appear that Nepal doesn’t have a vibrant martial arts tradition for exactly the same sorts of reasons that Europe didn’t in the 20th century. Harsh military competition forced the rapid adoption of new technologies by strong state led militaries. Civilians didn’t really have a market incentive to commercialize old technologies or second-line defensive strategies. This just isn’t the sort of place that one might expect to find martial arts. You might find a lot of violence, but that is not the same things as the “martial arts” per se. This all sounds plausible. But we are not done yet. The hypothetico-deductive method states that if we really want to test our theory we need to bracket our expectations about the big question we are asking and say to ourselves something like this “Ok, if my theory about the lack of martial arts in Nepal is correct, what else does it imply about the rest of society or the national at large.” In other words, if my theory is correct, what else (other than the main independent variable) do I expect to be present or different? It is entirely too easy to spin out plausible sounding stories. The night the Silver Blaze disappeared Sherlock Holmes could no doubt have pointed at the first suspect and told a pretty convincing story about why he did it. Then he could have gone to the second and the third suspects and repeating the exercise. It is just too easy to explain a given outcome that we already know, with facts that we already have. The human mind is a basically a meaning making machine. When we see a pile of facts we have to make them into a coherent story, we just can’t help ourselves. As a result there needs to be some sort of external check, and in our case it needs to reside outside of the realm of the martial arts. For instance, social scientists know quite a bit about how market forces and civil society affect state governance. Having a weak civil society affects all sorts of things. Governments are more likely to be repressive and to under-provide public goods. A weak civil society often leads to poor social capital formation. This hampers the ability of different groups to work towards common goals and it makes economic investment difficult or risky. Weak civil society tends to lower the rate of economic growth, increase instances of corruption and hamper the adoption of new and innovative technologies. Does any of this sound familiar? So let’s consider how this lack of civil society might affect something else, such as the area of “physical culture.” In order to have a robust sports movement you need investment and organization. Some of that is going to come from private sources, but in a developing state like Nepal the government will probably have to step in and show a fair degree of leadership for anything to happen. Nepal has a long tradition of being involved in local games and sporting events. Some of these local sports and games are shared with its South Asian neighbors (India) and others are unique. Given Nepal’s relative social isolation and lack of access (until recently) to the global media, one would think these traditional sports would be in great shape. Still, our previous theory about the importance of civil society and domestic market forces might suggest otherwise. The predictions that it yielded did not just apply to the martial arts, but to all sorts of voluntary associations. Without a certain level of economic surplus you can’t really sustain or promote “professional leagues.” Social isolation, either because of the caste system or simply the realities of geography, will make it hard to establish a broadly based and self-sustaining market in any good. Further, given the percentage of resources that the state and military dominate (they in effect are the single largest consumer in the entire Nepalese economy) their support could either make or break the venture. So what do we see if we actually investigate the question on the ground? I admit that I have never had the time to make a detailed study of the traditional games of Nepal, but from the reporting I can find, things look bleak. Once popular sports have been abandoned and are now played only by children on the street. There have been some efforts to organize tournaments in some of these games but remarkably the international efforts have actually been more successful than the domestic ones to date. Society as a whole seems to be too poor to invest in this area of its own heritage and the government lacks either the resources or the incentive to do so. This would all seem to imply that our emphasis on social and economic factors is paying off. Not only can these factors explain the presence or absence of the martial arts, but they can also tell us quite a bit about what is going on in any area of civil society, including the arena of competitive sports. This increases the amount of confidence we can place in our theory. Notice what else we have done. We have allowed our curiosity about the martial arts to reveal something much larger and potentially more important about social organization. These sorts of writing and research strategies have the best hope of making martial studies relevant to widest possible audience. Kukri’s identical to the ones above remained in service into the 1940s and 1950s. This long service life can make it difficult to determine where a given piece might have been used. Conclusion: Appreciating the both the Presence and the Absence of the Martial Arts. I doubt that this exercise really conclusively demonstrates why the martial arts are present in some areas but absent in others. That is a big enough question that it will require a lot more analyzing and writing by a number of scholars. However, if I have accomplished two things this essay will have been a success. First off, when testing theories we need to be conscious of our methods. The hypethetico-deductive method is useful because it allows us to not only avoid a certain set of logical traps, but it also, by its very nature, expands the scope of our research and conclusions to society as a whole. This is a connection that the field of martial studies must make in order to survive. Secondly, I hope that this essay reminds us not to the take the martial arts for granted. We often approach this subject with strongly held prior beliefs, but in the final analysis there is probably nothing about these arts that is either inherently “Asian” or “inevitable.” Only by asking about the dogs that don’t bark, the cases where we expected hand combat traditions to emerge but do not see them, are we likely to make progress in understanding the arts that we do possess. 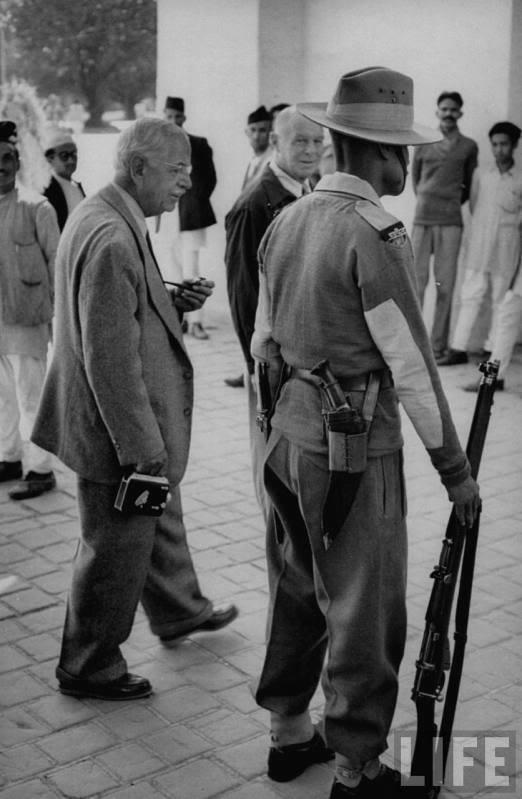 “Anyone with any knowledge of military history knows the golden rule – don’t mess with a Gurkha. But the knife-wielding mugger in this drama clearly had no idea what he was messing with. He pushed Taitex Phlamachha, a former member of the famous fighting force, up against a wall and demanded money. In the fight that ensued, a knife blade was buried in Mr Phlamachha’s arm, but he still managed to get the better of his attacker. The 38-year-old shop owner was taking an evening walk with his wife Asha when they stopped to look in the window of a health shop in Maidstone, Kent. Suddenly he was hurled against a wall and allegedly told to ‘hand over the money’, or be stabbed. The pair fell to the ground where the mugger knelt on Mr Phlamachha’s chest and tried to stab him. Click here to follow the rest of the story and for pics. Chalk up another win for the Gurkhas! I am pleased to read an interesting article on khukuri. Nepal don’t have any “formal” martial arts for civilians, but since the time immemorial Gorkha Armies and traditional bodyguards (Elite Soldiers) know how to wield a khukuri with other weapons and this tradition is still continued as ex soldiers teach khukuri fighting drills to new recruits as well as their children. As we take a strong sense of pride in joining army, the ‘informal’ training started very young for boys in fitness, including khukuri strategy and tactics, way before they join army, by their uncles and grandparents. So there is no need to borrow from japanese karate or any ‘formal’ martial arts to develop khukri drills and tactics. Now a days other martial arts are also learned by Gorkha soldiers and also I have to admit that modern day Gorkha soldiers, in general, are not as good as their ancestors in using khukri for obvious reasons. We can already notice the size, shape and weight of khukuri is quite significantly changed compared to older khukuri designs. But that does not mean that they don’t know the traditional and indigenous fighting techniques of khukuri.